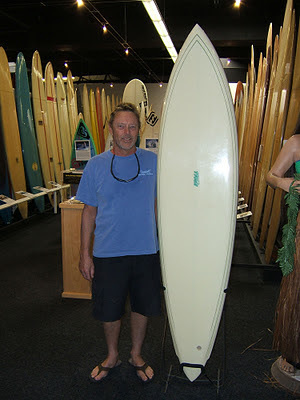 This winged pintail board was donated by its owner, Steve Hops who originally purchased it back in the mid-1970s. He only rode it once or twice and so it’s in pristine condition. After surfing around the internet for info on shaper Steve Kroll, I was only able to pick up these few tidbits. Kroll was a board builder from the Dana Point area and at one time or other shaped for Herbie Fletcher, Blue Cheer, Graphlite, Rick James, and South Shore as well as his own label. Apparently he was roommates in San Clemente with surf photographer, Ron Stoner at one point as well.